I love baking chicken breasts because you are almost guaranteed to have delicious, juicy chicken in about 30 minutes. The prep for this recipe is so minimal, which makes it the perfect weeknight meal! Pair it with your favorite veggie or salad and you have a quick, healthy meal! Preheat oven to 425 degrees. Combine garlic and oil in a bowl. In a separate bowl, mix bread crumbs and parmesan cheese together. Dip the chicken in the oil/garlic mixture, and then in the bread crumb/cheese mixture to coat. Place chicken in a glass baking dish and drizzle the remaining garlic/oil around the breasts on the bottom of the dish. Sprinkle the remaining cheese/breadcrumbs on top of the chicken. Bake in the oven for 30-35 minutes until chicken is cooked all the way through. Serve and enjoy! This soup is healthy, hearty and delicious! You can substitute other greens, like kale, or mix up the veggies depending on what you have in your fridge. Sprinkle a little parmesan over a warm bowl for a comforting, satisfying meal! Bring chicken, water, and Better Than Bouillon to simmer in a large saucepan over medium-high heat. Reduce heat to medium-low, and continue simmering until the chicken is no longer pink in the center, about 20 minutes. Remove the chicken and set aside to cool. Reserve the broth. Heat olive oil in a large pot over medium heat. Stir in onion and garlic. Cook and stir until the onion has softened and turned translucent, about 5 minutes. Add the potatoes, then strain the reserved broth into the pot. Bring to a boil over high heat, then reduce heat to medium-low and simmer until the potatoes are tender, about 25 minutes. Cut the cooked chicken into cubes. Add chicken and carrots to the simmering potatoes. Cook for 5 minutes, then stir in the spinach and roasted peppers. Simmer for 10 more minutes. Season to taste with salt and pepper, and sprinkle with grated Parmesan cheese before serving. Enjoy! I used about 7 or 8 pomegranates for the juice. I sliced them in half (like I would if I was juicing an orange or lemon) and used my citrus juicer. I then strained the juice through a fine mesh strainer…and voila! 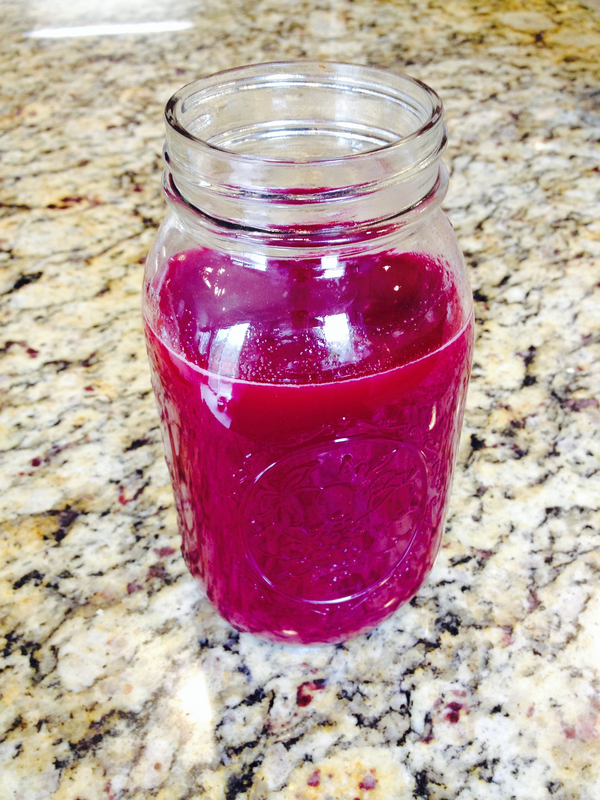 Delicious, fresh pomegranate juice! Took make it more palatable, I added the juice of 2 lemons and diluted it with water. Finally, I added drops of dark liquid stevia until I found it to be the perfect balance of tart and sweet. Here’s a picture of the pomegranate juice before I kicked it up to a lemonade. It looks like a liquefied ruby! Absolutely gorgeous juice! Food this beautiful makes me so HAPPY! Cut the pomegranate into 4 quarters. With the fruit still in the water, peel away the flesh and the seeds will sink to the bottom. Strain through a fine mesh strainer to easily remove the seeds from the water. I hope you are now inspired to eat more pomegranates! Please share your recipes in the comments! I’ve always been afraid of risotto…it just sounds so fancy and intimidating. I had some leftover oven roasted asparagus that I needed to use, so I decided to be be brave and take on the risotto challenge. Guess what? It was surprisingly easy and so tasty! I think this recipe would be perfect if you are trying to cook a romantic dinner for your special someone. Make sure you use high quality, organic ingredients to make this dish healthy (i.e. grassfed butter, organic cheeses and chicken). Simmer broth or water and Better Than Bouillon in a saucepan. In a separate 4-quart saucepan, heat 1 tbsp butter over medium heat. Add the shallots and cook until translucent. Add the rice and stir to completely coat, and cook for 2 minutes. Add the wine and stir slowly, allowing the rice to absorb the wine. When the wine is almost completely absorbed, add 1/2 cup broth to the rice and stir often to prevent the rice from sticking to the bottom of the pan. Continue stirring and adding broth in 1/2 cup increments, allowing the rice to absorb most of the liquid before adding more. Add chicken and asparagus to the rice with the last 1/2 cup of broth. Simmer and stir until liquid has been absorbed and rice is tender but firm to the bite. Turn off the heat and add the cheese and remaining 1 tbsp of butter. Stir until cheese and butter are melted and well incorporated. Add salt and pepper to taste, if needed. Serve immediately and enjoy! **Note: Brown rice takes much longer to cook, so you can consider an organic white arborio rice if you would like to speed up the cooking process. This lasagna is a warm, cheesy, bubbly delight! It is the epitome of comfort food, and it makes great leftovers. Even comfort food can be healthy when you use high quality, organic ingredients! Heat a large saute pan over medium-high heat. Add turkey or beef and cook until browned. Add 1 tbsp grapeseed oil and minced garlic and cook for about 1 minute. Add 1.5 jars of marinara sauce to meat and simmer on low. In a separate skillet, saute onion, zucchini, and mushrooms with 2 tbsp grapeseed oil for 5 minutes. Add veggie mixture to the meat/marinara sauce and stir to combine. Add spinach and oregano, stir and heat through. Spray a 9×13 glass baking dish with grapeseed oil cooking spray. Place a layer of lasagna noodles on the bottom of the baking dish. Spread a layer of the meat/veggie sauce over the noodles. Top with dollops of ricotta cheese (use about 1/2). Lay another layer of lasagna noodles, followed by the meat/veggie sauce and remaining ricotta cheese. Place one more layer of lasagna noodles over the top, and pour the remaining 1/2 jar of marinara sauce over the top. Spread the sauce over the noodles to completely cover them (this will help the noodles cook properly). Top with shredded mozzarella cheese. Cover with foil and cook in the oven for one hour. Cut, serve, and enjoy! I find that hiking and being in nature is a great chance to practice walking meditation. Breathe in and out consciously as you hike or walk, and become mindful of the present moment. You can nourish your emotional and spiritual well-being while improving your physical health. I love the idea of improving your “whole” self with one activity…talk about powerful! So, find a great trail and go take a hike! I promise you will be glad you did! Interested in more information? Check out this WebMD article and this article from American Hiking Society. After you wake up, go to your kitchen and gather the ingredients and materials you need. Combine the hot and room temperature filtered water in a mug to achieve warm water. It is very important that the water be warm, not hot. If the water is too hot, it will destroy the beneficial enzymes from the lemon and defeat the purpose of drinking the water! Squeeze the juice of 1/2 a lemon into the mug using the lemon juicer, and sprinkle with cayenne pepper. Add 2 drops of dark liquid stevia if you need to make it more palatable. Stir everything together and drink with a straw. Please use a straw to protect the enamel of your teeth! I must admit, this is not a beverage the Mindful Daddie and I enjoy drinking. The flavor is very tart and can catch you off guard first thing in the morning! If you find yourself second guessing why the heck you are drinking this not-so-tasty beverage, refer to the list above (which is just SOME of the benefits) and take that drink down! Then enjoy the beautiful health that comes your way! Want more information about the benefits of drinking warm lemon water first thing in the morning? Check out this post from Food Babe and this page from Underground Wellness! This is the beginning, the beginning of my spiritual journey. For most of my life, I was searching for a way to truly connect with my spiritual side. I was raised Catholic, so I always had a religious tie to spirituality but I never could seem to find the ability to truly have faith and believe the way I wanted to. I would pray, but usually only when I was asking for something or needed some help. As a college student, I found myself connecting more to Eastern philosophies of spirituality, like the teachings of Buddha and Zen ideals. It all made so much sense to me: lead a moral life, be mindful and aware of your thoughts and actions, and develop wisdom and understanding. These are such simple and beautiful ways to guide yourself (and your spirit) through life! Fast forward to the present. In grieving and mourning over the loss of my sweet baby at 13 months of age, I have finally been able to come to a place where I feel I am nurturing my spirituality. I am growing. I am discovering what it means to believe and have faith. I now know what it feels like to pray with your whole heart, and I know the power that my prayers have. When I pray, I give thanks for all of the amazing people in my life, as well as the many blessings that I am lucky to have. I pray for strength, guidance, and the ability to be the best possible version of myself. I pray for friends and loved ones who need support or healing. I am not just asking for help in times of distress anymore; it goes much deeper than that now. I still very much value the buddhist philosophies, and try to have them guide my thoughts and actions everyday. I know that I am serving my spirit when I keep my thoughts positive and my actions meaningful. By approaching my relationships and interactions with love and compassion, I am not only making my spirit grow, but I am also growing the spirit of others around me. Is that incredible, or what? So, what’s next for me and my spirit? I will keep working on being the best person I can be, and hope that my spirit will keep opening and blossoming. I recently developed a love for beets, and this is a good way to introduce beets to people who may be skeptical. It has some sweetness from maple syrup, and a little zing from the balsamic vinegar. Top it off with some feta cheese, and you (and everyone else!) is sure to love eating their beets! In a small bowl, whisk together the oil, vinegar, salt, garlic, and maple syrup. Pour dressing into a salad dressing container and set aside. 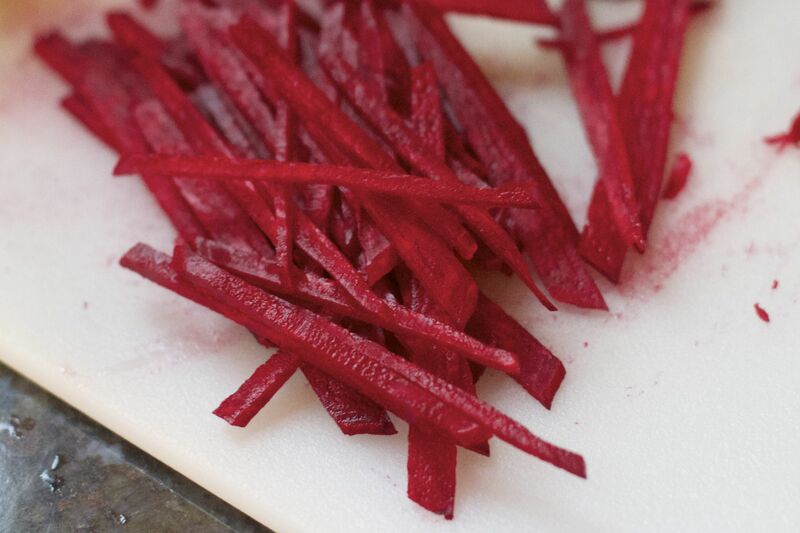 To serve, place a bed of baby greens onto each plate and top with an equal amount of beets. Sprinkle basil on top, and drizzle dressing over all ingredients. If desired, top with feta cheese. Enjoy! This recipe adapted from Christa Orecchio at The Whole Journey. Check out her site; it is a wealth of information and inspiration! As you have probably noticed, I do a lot of cooking with boneless, skinless chicken breasts! So I am always trying to find new flavors to spice up this simple protein! Here is my latest flavor combination: a little tangy, a little sweet, and a little spicy. Preheat the oven to 450 degrees. Season the chicken with salt and pepper. Heat the olive oil in a large ovenproof skillet over medium-high heat. Working in batches if necessary, add the chicken and cook until golden, about 4-6 minutes. Flip and cook 1-2 more minutes, then transfer to a plate. Leave all drippings in the skillet. Add the onion and apples to the skillet and season with salt and pepper. Cook until slightly softened, about 4 minutes. Mix in the Better Than Bouillon, water, mustard, and honey and bring to a boil. Place the chicken back in the skillet. Transfer to the oven and roast until the chicken is cooked through, 10-15 minutes. Mix the butter and flour to form a paste. Use a slotted spoon to transfer the chicken, apples and onion to plates. Bring the pan juices to a simmer, whisk in about half of the butter-flour mixture and boil to thicken, 2 minutes. Continue to cook, adding more of the butter-flour mixture as needed to make a slightly thick gravy. Season with salt and pepper. Pour over the chicken. Enjoy! This recipe is adapted from this recipe from FoodNetwork.com.